A funny and faithful retelling of the historical Christmas, showing why it matters today. Perfect for giving away. Scandal. Controversy. Massacres. Mystery... Christmas? This is a book about the real Christmas; the one that has been lost by being turned into a children's nativity play. The one that's been buried under made-up details about donkeys and innkeepers and kings. And this is a book about why what really happened at Christmas really matters today—about how these amazing events can transform people's lives and futures. 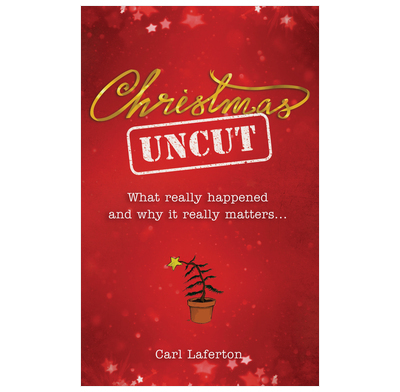 Short, funny, friendly and easy-to-read, Christmas Uncut retells the Christmas story, and explains the gospel message as it does so. Perfect for giving away to unbelieving family and friends, whether they think they know the Christmas story, or know that they don't; and ideal for giving away at the end of Christmas church events. We have developed some Christmas Uncut themed promotional materials for evangelistic events. They are free to download and can be found under the 'Look-Inside' link on the left. Was given this a few years ago but only got round to reading it recently. Thought this was great but it is probably better to say "thankfully" rather than "luckily" (p5). A worthy re-telling of the Christmas story which lent itself perfectly to our youth-led service. Bonus: buy in bulk and give away at the end! This would be a fantastic book for giving to someone either just starting out on their journey with God or as a conversation opener with someone who perhaps has been taking an interest in God but isn't sure yet. Well written, at times humorous and eye-opening. I would recommend this to everyone. I bought this book for my work colleagues. I wanted something that would be relevant and would explain the gospel message clearly too. I wasn't disappointed with this. It was a down to earth, and amusing at times but balanced with serious and helpful explanations of the Christmas story. i would definitely recommend it as a useful evangelistic tool. Written in a chatty, approachable style, Christmas Uncut is easy to read, for Christians and non-Christians alike. No jargon, just straight-forward explanations of what really happened and why the Christmas story really matters. I would not be uncomfortable giving this to a non-Christian, and if they reject the challenge it contains, at least they can't say they didn't understand. At Easter and Christmas I look for small books(lets) and enclose with a card for the season to the neighbours, and give one to people who have shown a small kindness (shopkeepers, etc) and have never had one returned or refused. This year I have purchased 20 "Christmas Uncut" for the same outreach purpose and have had good comments from people who have received them. I think the way it is written grabs the attention. I really liked this book as I was looking for something non judgemental to use as gospel outreach. Nativity plays are of interest to parents, grandparents and in general a source of laughter, We all have funny stories to tell ! From this common theme the author brings out quite deep teaching and theology in an easy attractive way. i would think it is really good to hand to those folk you are not sure quite where they stand. I sent for a load of christmas outreach and this is by far the best! Good content. Nice tone - amusing at first, but dealing with serious issues appropriately. Excellent price for bulk give away (£1 each for 100). Great to make available to Christians to use with family, friends, neighbours etc. "Christmas Uncut" is a short, quick read about what really happened at the first Christmas. The tone was casual and sometimes humorous, but the author kept focused on his point. He accurately portrayed what the Bible says about Christ's birth and the purpose of his birth, life, and death. Each chapter started with a short, funny story about a nativity play, and he used this to illustrate a point. The author then explained what really happened according to the Bible and filled in some cultural and historical background so the events can be understood better. He then explained why knowing the real story matters--how it changes our perspective of the events. He covered the angel telling Mary that she would become pregnant, the angels announcing Jesus' birth, the shepherds coming to see Jesus, the magi, how Herod reacted, what Simeon said, and why Jesus came in the first place. While it's an interesting look at Christmas even for most Christians, the book seemed geared toward non-Christians familiar with nativity plays. Overall, I'd recommend this book, especially to those who don't know much about or haven't thought much about what the real Christmas would have been like.